Subtext, Part 1: What is Subtext? Subtext is one of the strongest, most powerful narrative tools a storyteller has in their arsenal. That’s awesome! But what exactly is subtext? The short answer: Information that is communicated without coming out and directly saying it. The very short answer: What ISN’T said. Great question. Big, complicated answer. To answer that question thoroughly, we will start by grazing the surface of subtext with Part 1 in our article series before proceeding to a deep dive into the subject. Part 2 will explore what subtext is, how it functions, and the many forms in which it can be used in significantly greater depth. Subtext is many things, and nailing down a helpful description in a single phrase always falls short. The trickiness lies in the fact that subtext isn’t directly written, stated or spoken. It is the ever present invisible context inhabiting the shell we call text—that is, the underlying story beneath the outer story crust. Like any informational source, story consists of two layers: Text and Subtext. In a conversation between two people, text represents the words each participant says to the other while subtext includes everything they aren’t saying. That doesn’t mean subtext includes everything they could possibly or potentially say in that situation, but rather the meaning behind the strategy and delivery of the text. Where Subtext falls in the layers of storytelling. If Person A asks Person B, “Did you drive today?” The text of Person A’s question is obvious—exactly what (s)he came out and said. However, the subtext—what Person A didn’t say—is far richer and meaningful: Do I have to give you a ride today? The tone of Person A’s voice, the emotional backing and the context in which the question was asked add subtext as well. So while the text may be a simple question, the subtext alters the meaning depending on whether it was asked with a groan or with the intent of helping out a friend in need. The short answer: Subtext creates meaning. Subtext represents the emotional core of your story. Not restricted by genre, medium or storyteller, subtext is the hidden power that gives the text its emotional and thematic punch. Depth and nuance are almost entirely contained in this layer of story. A story cannot succeed without effective subtext because the text itself cannot adequately communicate meaning in a way that feels fulfilling or satisfying. The audience will notice when subtext is missing—whether they are consciously aware of it or not—because the story will feel hollow, motivations poorly formed, and characters lacking in dimension. If Subtext is so Important, Why Do I Need Surface Text? The short answer: You need both. Always. Surface text acts as a simple vehicle to put the subtext into a context that makes it tangible, specific, and easy to understand. By itself, subtext comes across as abstract and vague. Text without subtext feels superficial and forgettable. Therefore, every story needs both subtext and text because the story will feel incomplete with only one or the other. Surface text tells us what happens, not what it means. Subtext tells us what it means, not what happens. Text + Subtext tells us what happens and what those events mean. How Do I Create Subtext? The short answer: By talking around the obvious. Subtext arises through restraint from revealing the mystery and explaining all, creating implication of the greater struggle that lies beneath the surface—conflict, the heart and soul of story. Basically, by not using direct exposition (text). Don’t say what you mean; say all the things that approach the subject indirectly without giving away the whole story. Think about the exposition as an aerial view of the whole forest but the audience only gets to see the trees up close at ground level. Subtext provides clues to solving the mystery without directly saying, “The butler did it.” The audience will absorb the evidence and come to that conclusion themselves, but in a way that creates a more cathartic experience because they were actively involved in the emotional journey and not just a passive participant. If a character wants something in a scene, don’t let them say so. Have them employ different tactics to approach the subject indirectly without identifying the want directly. If a character feels an emotion, don’t let them say exactly who they feel. Have them express or explore other secondary emotions or outward effects without dialing in on the root cause. We’ve only just started talking about subtext here in Part 1 of our article series. Stay tuned for Part 2: What Does Subtext Do? Feeling lost? Story Science is here to help! Contact us right away and we will help you find your way. Of Mice and Men might as well have been called “the ranch of broken dreams.” Presenting itself like a stage play in all but format, author John Steinbeck maintains Aristotle’s unity of place and time by focusing our attention on a microcosm inhabited by two men who share a single hollow dream. Ultimately, their dream collapses due to their own human weaknesses and those of their fellow men. The fundamental core of the story illustrates how human beings latch onto hope, real or imaginary (but in either case perceived as actual), as a goal to strive for, as a reason for living, and how and why reality seldom plays out like our dreams say they ought. Of Mice and Men packs brutal emotional impact through realistic, layered characters and relationships in this structurally sound novella. 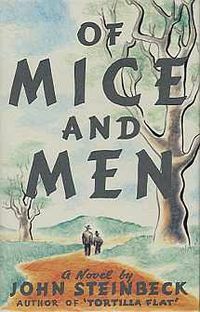 Readers will find Of Mice and Men much more accessible than Steinbeck’s far more brutal Grapes of Wrath, and should be required reading for any serious reader or storyteller.